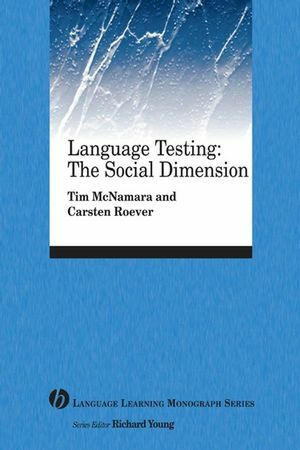 This volume focuses on the social aspects of language testing, including assessment of socially situated language use and societal consequences of language tests. The authors argue that traditional approaches to ensuring social fairness in tests go some way to addressing social concerns, but a broader perspective is necessary to examine the functions of tests on a societal scale. Considers these issues in relation to language assessment in oral proficiency interviews, and to the assessment of second language pragmatics. Argues that traditional approaches to ensuring social fairness in tests go some way to addressing social concerns, but a broader perspective is necessary if we are to fully understand the social dimension of language assessment. Tim McNamara is Professor of Applied Linguistics at The University of Melbourne, where he gained his Ph.D. in Applied Linguistics, and where he helped establish the Language Testing Research Centre, of which he was subsequently Director. His research interests include language testing, language teaching, and language and identity. His recent work has focused on the relevance of contemporary social theory to concerns in language assessment and other areas of applied linguistics, including the role of language tests in the processing of the claims of asylum seekers and in citizenship procedures. He is the author of Language Testing (2000) and has published widely in applied linguistics journals. Carsten Roever is a Lecturer in Applied Linguistics at the University of Melbourne. He has a Ph.D. in Second Language Studies from the University of Hawai‘i at Manoa. His main research interest is the assessment of second language pragmatics. Some of his favorite topics are acquisition of pragmatic knowledge, second language aptitude, web-based language testing, and research design. He has published in Language Testing, Language Learning & Technology, and various edited collections. 2. Validity and the social dimension of language testing. 3. The social dimension of proficiency: How testable is it?. 4. Psychometric approaches to fairness: Bias and DIF. 5. Fairness reviews and codes of ethics. 6. Language tests and social identity. 7. Language assessments at school: Social values and policy. An innovative look at the social aspects of language testing, including the assessment of language use in social settings and the societal consequences of language tests.